British sculptor Alex Chinneck created a giant “ice cube” with a tree inside it at King’s Cross this year. The artist’s impressive sculpture stands at 17 ft tall and is adorned with 1200 lights. 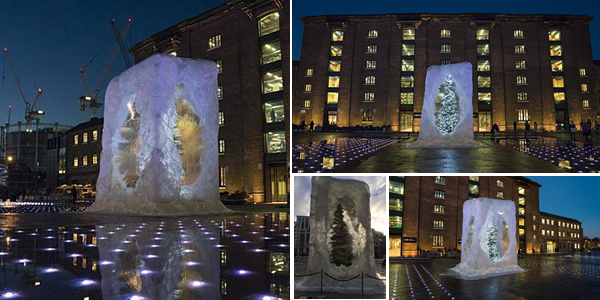 The ice effect is created with resin that “trickles” into the fountains on Granary Square, emphasising the illusion of melting ice. Chinneck may have used the tree being “stuck in a melting block of ice” as a symbol of new beginnings that a new year often promises…. Truly inspiring! 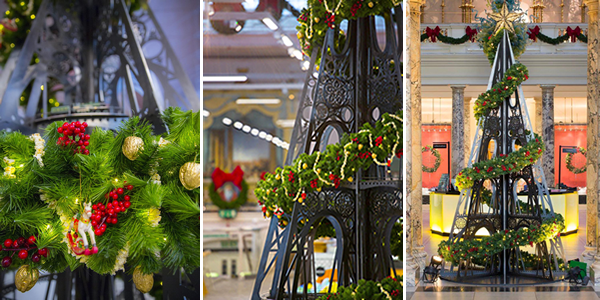 Situated in the V&A Museum, the tree takes Britain back to her industrial heritage. The iron structure is a significant reference to the Industrial Revolution and the decadent attention to detail within the sculpture highlights the “Gothic” obsession that the Victorians loved so much. 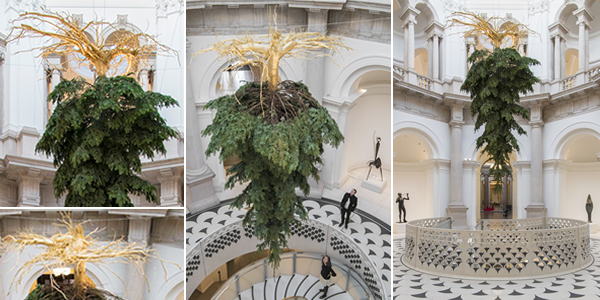 Hung in Tate Britain, the Christmas tree has a little twist: It’s upside-down! Keeping the decorations to a minimum, Houshiary ensure that the main focus becomes the natural elements of the tree itself; the colour, texture, smell and shape. The talented Iranian artist has enforced focus on the roots by making them gold, highlighting where “the source of life comes from”. Being suspended between the gallery floors, the exhibit allows the opportunity for viewers to see the feature piece from various angles. Over the last few years, it has been tradition for a designer to design the Christmas tree for the luxurious Claridge’s Hotel. 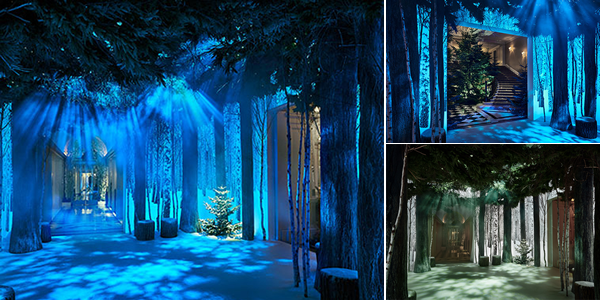 Sir Jony Ive and Marc Newson have created much more than just a tree this year and have instead installed a “Winter Forest” throughout the hotel lobby as you enter. Sir Jony Ive is the Chief Design Officer at Apple and Marc Newson is one of the World’s most influential industrial designers. Their magical, snow covered forest is a creation that emphasises what can be crafted when art and technology are infused. A magnificent masterpiece. Designed by British sculptor Antony Gormley, the impressive Western Red Cedar tree is 17.5 ft tall and originates from Shropshire. 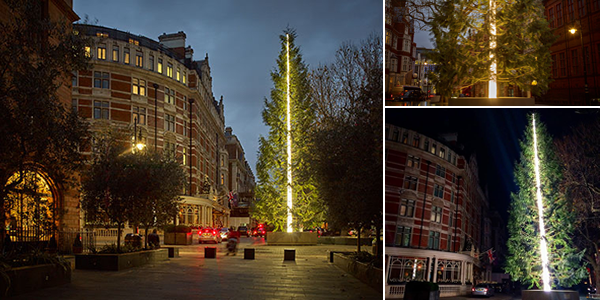 Situated outside the Connaught Hotel on Mount Street, rather than having decorated the outside of the tree, bright light ascends the tree trunk instead, creating a column of light. Taking a different approach to decorating a tree, having the trunk light up creates the illusion of the tree being struck by lightning, in turn creating a striking effect within the heart of Mayfair…. Beautiful!